The original Fletcher Hebb Bridge was a simple span steel girder structure with reinforced concrete deck and abutments. The original structure had reached the end of its service life and was in need of immediate replacement. 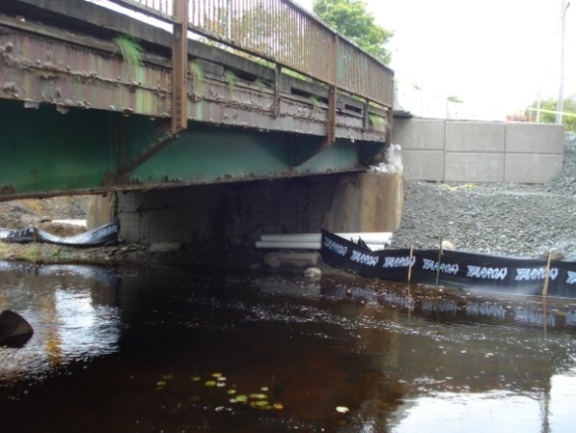 Dexter Construction was awarded the design-build contract for demolition and replacement of the existing bridge structure for NSTIR. HEC was hired by both Dexter Construction and Shaw Precast to carry out the design of the new bridge and provide construction engineering services. The new bridge was constructed with 18.266 m long precast concrete rigid frames (SuperShawSpans) with short legs (to maintain construction activities in dry conditions) founded on a reinforced concrete spread footing at the east abutment and steel H-piles and reinforced concrete pile cap at the west abutment. A cast in place reinforced concrete barrier with aluminum railing was used for the traffic barriers. This project was particularly challenging given the very tight schedule and requirement to limit the road closure to seven (7) days. To meet the schedule and road closure limitation, accelerated bridge construction techniques and a phased approach to construction was required. The new spread footing, piles and pile cap were installed in two separate phases prior to road closure, demolition and erection of the new structure. 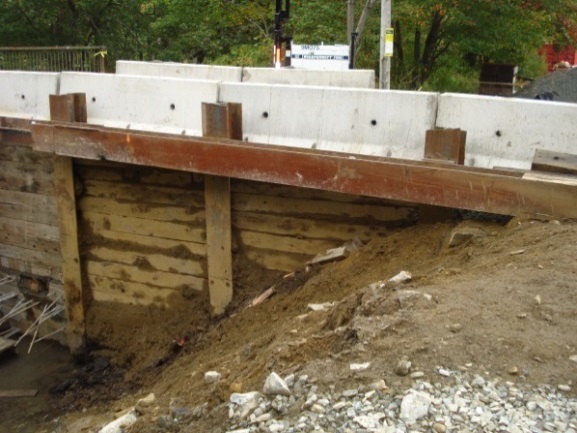 HEC developed the phased approach to construction and designed a timber lagging wall system with dead men and struts/ties that allowed the north half of the bridge to remain open while the south half of the road was excavated to construct the south half of the spread footing, pile cap and piles. After the south half of the foundations was complete they were backfilled and traffic was rerouted to this half of the bridge. The north half of the roadway was then excavated to allow construction of the north half of the spread footing, piles and pile cap. Once the foundations were complete the road was closed, the existing bridge was demolished, new structure erected and paved with temporary barriers within a seven day closure. The project was completed on time, on budget and within the permitted road closure.